This recumbent bike is a heavy duty model meant for larger folks and it certainly holds up well to stress and pressure. This is most likely one of the most durable recumbent bikes out there, plus it has some other really neat features too. 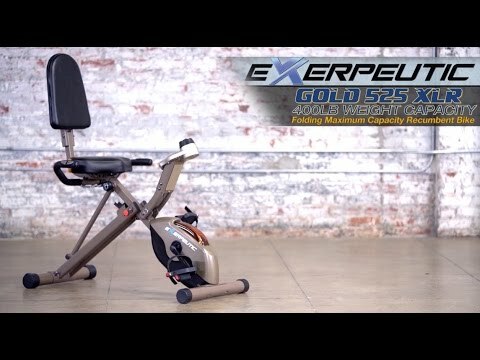 If you would like to find out a little bit more about the Exerpeutic GOLD 525XLR Folding Recumbent Exercise Bike, you can check out the video below. The Exerpeutic GOLD 525XLR Folding Recumbent Exercise Bike has quite a few features that are definitely worth mentioning. When it comes to the size and weight of the Exerpeutic GOLD 525XLR Folding Recumbent Exercise Bike, it is not all that big. In fact, this model, while made to be durable and resilient to wear and tear, is in fact able to fold down for easy storage. It’s not too heavy or too big, making it quite a convenient choice to go with. The Exerpeutic GOLD 525XLR Folding Recumbent Exercise Bike comes with a 1-year limited warranty, which is honestly a little less than we would expect from a piece of equipment that costs over $150. One thing that does need to be mentioned about assembling the Exerpeutic GOLD 525XLR Folding Recumbent Exercise Bike is that it is somewhat difficult. Most people would say that putting this recumbent bike together is a two-person job. Two people should be able to put it together in little over an hour. The real problem is that the assembly instructions are very lacking and confusing. That being said, the tools and parts are all included. If you want, you can always choose to get expert in-home assembly for an additional cost. There are a few stand out features of the Exerpeutic GOLD 525XLR Folding Recumbent Exercise Bike which are worth talking about in some detail. One of the things that we really like about the Exerpeutic GOLD 525XLR Folding Recumbent Exercise Bike is that it is made with roughly 30% more steel than other similar models. This is because this particular model is meant to be very durable and built for heavy duty use. The Exerpeutic GOLD 525XLR Folding Recumbent Exercise Bike can support users of up to 400 pounds in weight, making it an extremely strong recumbent bike. This model also comes with leg stabilizers to help make it more stable on uneven surfaces. Another thing that we really like about the Exerpeutic GOLD 525XLR Folding Recumbent Exercise Bike is that it is very space friendly. It is not very big and will easily fit into most spaces. Even better is that this recumbent bike can fold down to about half the size, making it easy to store in tight places such as a small closet. Even though the Exerpeutic GOLD 525XLR Folding Recumbent Exercise Bike is very durable and made with large amounts of steel, it is actually not that heavy either. It even comes with transportation wheels to make it easy to maneuver. Something else we like about the Exerpeutic GOLD 525XLR Folding Recumbent Exercise Bike is that it comes with 8 levels of magnetic resistance. Magnetic resistance does not suffer from much wear and tear, plus it is very quiet too. The resistance can be easily adjusted with the tension dial. Moreover, the crank and transmission system of this recumbent bike are both made to be very smooth and quiet, thus providing you with a very enjoyable ride. Another beneficial aspect of the Exerpeutic GOLD 525XLR Folding Recumbent Exercise Bike is that it has a great seat. The seat on this model is ergonomically designed for comfort, plus it has lots of padding too. The seat on this model is also adjustable for length in order to suit people of various sizes. There are a couple of things which could be improved upon with this model, so let’s just go over those real quick. We don’t like how this recumbent bike only has 8 resistance levels and no programs. For the price which the Exerpeutic GOLD 525XLR Folding Recumbent Exercise Bike costs, we would expect a little bit more. We do not like how the assembly process for the Exerpeutic GOLD 525XLR Folding Recumbent Exercise Bike is seemingly overly difficult. So you have a bit of a reference point, let’s quickly talk about some of the alternative entry level recumbent bike models that you could go with. The Sunny Health & Fitness SF-RB1117 Folding Recumbent Exercise Bike is significantly cheaper than the Exerpeutic 525XLR Bike, which is for good reason. The Exerpeutic 525XLR Recumbent Bike is much stronger, more durable, more stable, and has a much higher weight limit than the Sunny Health & Fitness model. Other than that, both models are fairly similar in terms of their functionality. Both fold down for storage, both are lightweight and compact, and both have 8 magnetic resistance levels. The ProGear is a good alternative as well. One thing that needs to be said is that its weight limit is not nearly as high as the Exerpeutic 525XLR Bike, plus the frame is not nearly as strong. The Exerpeutic 525XLR Recumbent Bike can also fold down into a compact package for easy storage. However, on the other hand, the ﻿ProGear﻿ model has way more resistance levels plus it has workout programs which the Exerpeutic 525XLR Recumbent Bike does not have. The bottom line is that the Exerpeutic GOLD 525XLR Folding Recumbent Exercise Bike is a great choice to go with. It folds down like many other models, it saves space and is not too heavy, and has a decent amount of resistance too. The standout feature here is that it can handle a whopping 400 pounds of weight.